Garden City, KS-By the time the final buzzer sounded on Tuesday night, Garden City boys’ coach Jacy Holloway had run out of superlatives for Kyler Lamb. “You could see it in his eyes,” he said. Whatever look the senior gave his teammates minutes before tipoff, was a brief glance into one of the best shooting performances in the history of the school. Lamb hit his first 10 shots of the night, scored a career-high 27 points and drilled four 3-pointers, guiding Garden City to their most lopsided win of the season, 65-43 over Hugoton at the Garden. Lamb’s super-human effort was all part of a team concept, one that included a heavy dose of ball movement and pin downs. By night’s end, his right hand was wrapped in ice, and even that couldn’t cool him off. 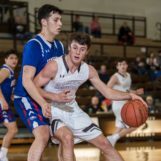 Lamb scored his team’s first seven points, Garden City forced eight Hugoton turnovers in the opening stanza including three straight to begin the game, and the Buffaloes raced out to ta 25-2 edge after one. As a team, Garden City was 10-for-11 from the field in the first frame. Lamb’s 11-point first quarter was outdone by his performance over the next eight minutes. He nailed three more triples in the second period including an off-balance long ball from the right wing that gave the Buffaloes their largest lead of the night, 33-6 with 4:03 left in the half. Lamb’s first-half stat line: 22 points on 10-of-10 from the field and 4-for-4 from 3. His team was 14-of-19 (74 percent) through two quarters and led 36-19 at the intermission. They literally shot the lights out. As the second half was about to resume, the gym lost power. And while crews tried to restore the electricity, fans throughout the Garden were asking just how this would affect Garden City’s hot hand. The extra 15 minutes didn’t cool the Buffaloes off. It also allowed Hugoton to refocus. The Eagles came storming back, using a 10-0 run that was capped by Carlos Montiel’s second-chance bucket that cut the Garden City lead to 10, 48-38 with 6:00 to go in the game. Garden City buckled down and finished the game strong. Azavier Williams hit a contested layup, and Carlos Acosta nailed a jumper from the foul line, as the Buffaloes closed the contest on a 17-5 run over the final six minutes. Acosta enjoyed an efficient night, chipping in 19 points on 8-of-11 from the field and 3-for-3 from the line for Garden City, who avenged last year’s 30-point loss at Hugoton. Jarrod Springston, who gave everyone a scare when it looked like he tweaked his ankle again, scored eight points and pulled down five rebounds. Montiel led the way for the Eagles with 15 points and six boards. His team shot just 33 percent (15-of-46) and were just 4-of-17 (24 percent) from 3. Garden City, KS-Over the last six years, no team has epitomized consistency in the small-school ranks more so than the Hugoton girls. But this version of the Eagles is a far cry from the one that went 26-0 just two years ago en route to their second state title in three years. The Buffaloes looked like the superior team from the jump. Taryn Tabor knocked down two 3’s in the first two minutes followed by five straight points from Rodriguez, and Garden City had an 11-3 lead halfway through the first. They were up four going to the second, and stretched that to as many as 11 when Keyhana Turner polished off an 8-0 blitz by splitting a pair of free throws to make it 25-14. They held Hugoton scoreless for nearly five minutes to close the second before Breckyn Haar hit a hook shot from the right block to cut the brown and white’s lead to 25-16 at the break. Though their offense struggled at times in the second half, the Buffaloes did something they failed to do at Hays just three days earlier: hit free throws when it mattered most. Once Hugoton closed the gap to five on McKenna Hamlin’s trey with 2:22 left in the fourth, the Buffaloes put the clamps down, holding the Eagles scoreless the rest of the way while nailing 10-of-12 at the line in the final period. Rodriguez finished the game 8-of-12 from the stripe and pulled down a team-best eight rebounds for Garden City, who improved to 5-2 on their home floor this season. Symon Simmons chipped in eight of the bench, and Tabor added seven.